Lasagna was one of the first things I made from scratch in college when I finally started cooking on my own full time. It was so much work, and when I was finished I had used every pan in the kitchen and was completely exhausted. When I finally tasted it all could I mutter was…eh. It was okay, but by no means worth all that work, and I would have taken a store bought lasagna over what I had just slaved over any given day. I didn’t have time for meals like that. I was a busy college student…I had boys to date, parties to attend, and reality TV to watch. 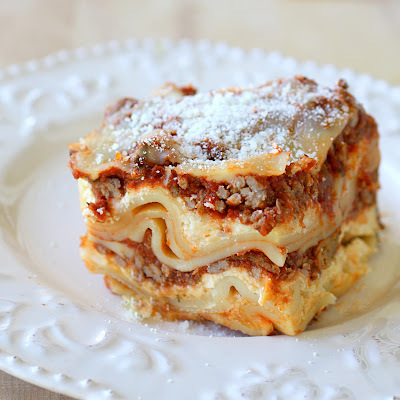 When I came across a recipe for Crockpot Lasagna, I was intrigued. What a genius idea if this version truly was any less work than the traditional version. I was skeptical to say the least for the work that it was going to involve and had even lower expectations for what the taste would be. The preparation was quick and seemed way too easy compared to what I was used to. As we sat down for dinner, I warned my family that this was an experiment and I had no idea how it would taste. I was pleasantly surprised, and swore this would be the only way we were doing lasagna in my house from now on. This is perfect for company when you don’t want to spend all day in the kitchen. Next Post » A couple of New Year’s Eve food ideas…. Sorry! I’m not very familiar with gluten free products so I’m sorry it didn’t turn out. Just made this today, followed the recipe to the letter and it was DELICIOUS! My family loved it. I found this recipe about a year ago and have been loving it (and others) since then. It’s in the crockpot ready to go tonight. Everyone loves it and most ask for the recipe which I happily share. Thanks for all your hard work in making these delicious recipes available for us. I love making lasagna, but hate how long it takes. But i came across your recipe a couple of weeks ago and gave it a shot. OMG! It was wonderful!!! I will never make lasagna the traditional way. Thank you so much!